BEAVERTON, Ore. – Beaverton City Library reveals today its Library of Things, the newest collection at both the main library (12375 SW 5th Street) and the Murray Scholls branch (11200 SW Murray Scholls Place). A Library of Things is a collection of items for loan that expands the boundaries of traditionally defined library materials. Please join us as we celebrate this exciting new resource for our community! 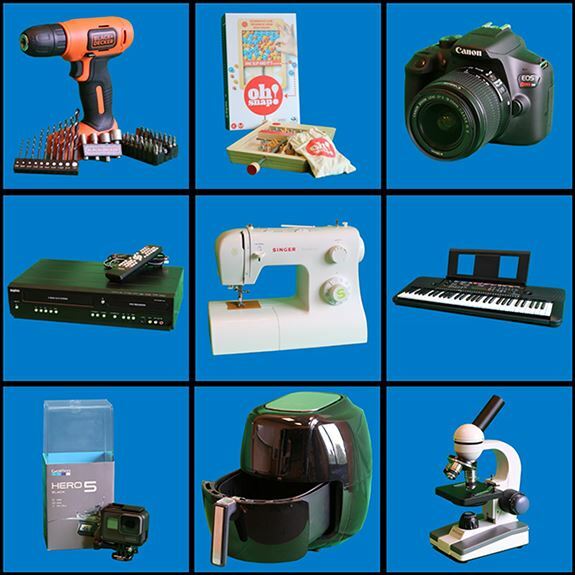 The “things” in Beaverton City Library’s new collection include a sewing machine, digital camera, microscope, air fryer, cordless drill, GoPro, keyboard, board games, and more. While many items are intended for use by adults, there is also a Juvenile Library of Things, which includes items like STEM toys and coding games for kids. A natural evolution of the library’s existing lending model, this collection will supplement the library’s approach to meeting the needs of our diverse and growing community. It supports the “sharing economy” and the city’s sustainability efforts, as patrons sharing items means less waste. The collection also offers an opportunity to “try before you buy,” to save money, and to test out something you might not have come across otherwise. Library of Things collections have been emerging in libraries around the world, each providing their own unique take. In fact, Beaverton City Library has been loaning ping-pong paddles for use on the concrete ping-pong tables in City Park for many years. In August 2017, library staff formed teams to find out what patrons, volunteers and staff would want to see in the Library of Things, and work out the details of building and maintaining the unique collection. In October 2017, the library conducted a community survey regarding what kinds of “things” would be most appealing to check out. The top-voted category was “board and card games,” followed by “technology/electronics” and “musical instruments.” The survey generated interesting suggestions for specific items, including a boyfriend, a family to go camping with, a hug, a car, and a food truck. The new collection gained national interest and local excitement when it was featured on Good Morning America in November 2017. Throughout the winter, the Library of Things quietly took shape behind the scenes as staff cataloged and packaged items and stored them out of sight, and made decisions about where items would be shelved and for how long items would check out. The Library of Things collection is funded through the library’s materials budget—just like books. For now, in the early stages of development, donations of “things” to the Library of Things collection are not being accepted. For more information, visit www.BeavertonLibrary.org/LibraryOfThings or call 503-644-2197. Previous PostPrevious The World’s Favorite Feel-Good Musical Performed LIVE at Broadway Rose!